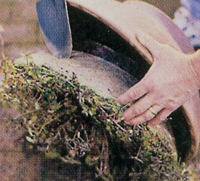 Learn how to eliminate plant disease in your garden pottery and how to manage the conditions that can cause them. 5 great tips. 1. You need to start with the plants you purchase from your local nursery or landscape center. Read in garden books the many ways to spot troubles before you take them home. Always check the top of plants and inspect for root quality. The soil should not be pulling away from the outside of the planter or look dried out. This can mean the roots are bound up and not healthy. Dark or musty roots sticking out the bottom are not a good sign either. Make sure the garden planter you are going to use at home has been cleaned and dried out completely. 2. Keep an eye out for bugs. Viruses and bacteria can only enter a plant thru some sort of opening and bug damage provides that. Aphids are on of the most common carriers. Use good compost yard waster or purchase a good potting soil. Thorough composting generates high temps for extended lengths of time, which actually kill any pathogens in the soils. If you are not sure of the conditions of the compost pile avoid using it. 3. 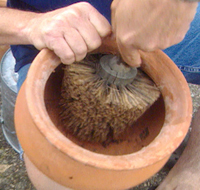 It is best to clean out your garden pots every fall, even if you live in a mild climate. This is not only an effective deterrent to disease but also a good way to control it. Disease can last on dead leaves and debris and attack the new leaves as they emerge in spring. If you are leaving stems and foliage to create winter interest be sure and remove them before new growth starts. 4. Make sure you use the correct fertilizer. You need to take care since too much of any fertilizer can burn roots, reducing their ability to absorb water. Pruning damaged limbs at the right time is very important. 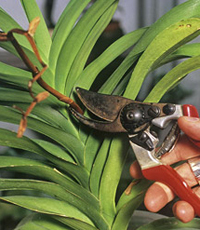 Trimming potted trees and shrubs in late winter is better than waiting until spring. Wounded limbs can become infected over winter allowing disease to become established. Always use sharp clean tools to make clean cuts that heal rapidly. 5. Plant disease resistent varieties - they can fight off the disease instead of succumbing to it. Nursery employees can help you identify the best varieties. Don't crowd the pots. Take care when spacing the plants and keep an eye on them. 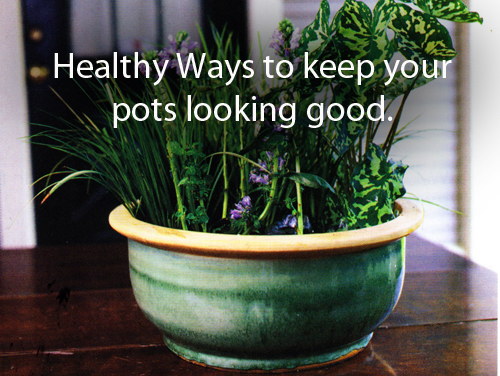 Crowded pots create their own humidity which allows disease like mildew to thrive. Improving airflow around your plants reduces this problem and is healthier for the roots sytems.